The cottage offers 2 ample sized bedrooms, which comfortably sleep 5 people. There is also room for a cot. Downstairs is a well equipped kitchen and utility room with electric oven and hob, fridge freezer, microwave, dishwasher, washing machine and tumble dryer. The dining room is furnished with a table and chairs for six. There is a bright conservatory opening to the rear garden. The lounge is spacious and comfortably furnished with a wood burner. Outside there is an enclosed garden with furniture and parasol along with parking for two cars. Bed linen, towels and tea towels provided. Oil, electricity and an initial basket of logs provided. Travel cot and highchair available - NO cot bedding. Strictly no pets or smoking allowed at this property. Caroline, John and our boys Thomas and Jamie would like to welcome you to our holiday cottage. We bought Appletree cottage after enjoying many holidays in the Cotswold. After using it as a holiday home for a few years we liked the area so much we chose to move here on a permanent basis. We have kept the cottage so that it can be enjoyed by others. The cottage is in a beautiful village and close to Stow-on-the-Wold which offers a great selection of shops and restaurants. This is the heart of the Cotswolds and the area offers some of the most best countryside in England. The Cotswolds has something for everyone. The cottage is a very large 2 bed detached property so you get all the benefits of a home from home. We have WiFi, basic sky TV, Dvd player with a selection of dvds for both children and adults and hi-fi system. The conservatory is a real bonus in the warmer months and opens onto the rear garden. The two bedrooms are spacious, the master has a double bed and the other has three singles. There is a bright shower room. The wood burner comes with a basket of logs so you can enjoy a real fire if you visit us in the colder months. The oil fired heating is included. A spacious cottage designed to offer you a home from home stay in one of the most beautiful locations in England. Appletree Cottage was satisfactorily equipped and John responded to our questions in a very timely manner. The property was clean, the shower was excellent, the conservatory was lovely, the heating system was quick, however, some attention needs to be given to “small things”. Because we were cooking frequently, we became quite familiar with the kitchen. The drinking glasses need replacement. There was not a frying pan that was useable - all warped or the Teflon coating was worn off. The front door lock is in need of replacement as it was very difficult to unlock. We did all of our dishes by hand as the dishwasher was not in the kitchen but in a separate room with the clothes dryer. We appreciated all of the manuals for appliances and a wealth of travel brochures and books. Thank you for your review. I am glad that you enjoyed your stay in the cottage. We try to think of everything that guests might want for and enjoyable stay. I have attended to the small items you mentioned. Thoroughly enjoyed our stay. Cottage beautiful and clean lovely comfy beds and a nice welcome tray. Ideal for visiting all the lovely villages. Very quiet village, and plenty of space in the house for our family of four. Comfy beds and lovely back patio. Easy access to nearby Stow (five minutes away), and a quick walk to a particularly beautiful pastoral footpath! A great stay—thank you. We wanted a place to relax after a few busy and fun-filled days in London, and to have access to some Cotswolds footpaths. The Appletree Cottage served both those purposes. We loved watching the English win their soccer match in The Golden Ball pub right around the corner from the cottage. Our gracious hosts made sure we knew about local destinations and how welcome we should (and did) feel. Perfect place for our family to gather for the weekend. We enjoyed being able to drive to Stow in a matter of minutes or walk to the local pub. Appletree cottage is in the peaceful village of Lower Swell, approximately 1 mile from Stow-on-the-Wold, the heart of the Cotswolds. 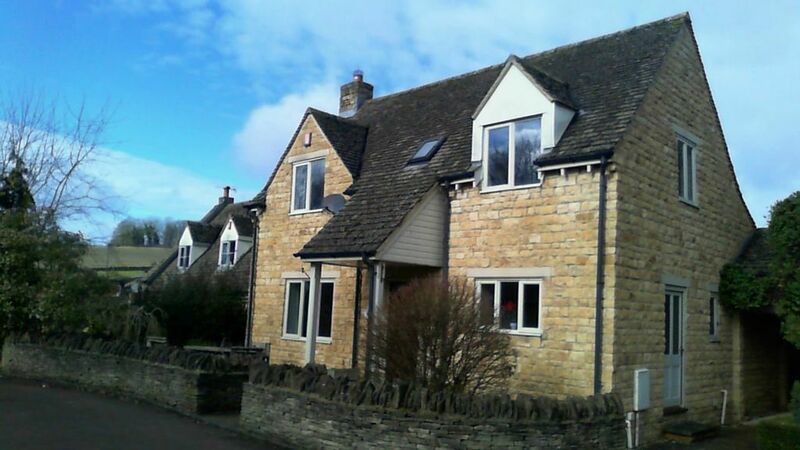 The cottage is a detached Cotswold stone property in a quiet village location. Lower Swell is a quiet village with a pub within easy walking distance of the cottage. Nearby Stow-on-the-Wold is an ancient Cotswold wool town. It has an old market square with stocks on the green and offers a wide selection of pubs, restaurants and specialist shops. Walkers will enjoy the many countryside walks on the doorstep. The cottage is the perfect base to explore the Cotswolds. Burton-on-the-Water, Chipping Camden, Broadway, Burford and Winchcombe are all beautiful villages all nearby. Oxford, Cheltenham, Gloucester, Warwick and Stratford-upon-Avon are all less than an hour away by car. There is a mainline train station going to London from nearby Morton-in-Marsh. Local attractions include : Batsford Arboretum, Model village, Kiftsgate Court Garden, Cotswold Wildlife Park, Blenheim Palace, Sudeley Castle, Cotswold Farm Park (the home of Adam Henson of BBC countryfile), Snowshill Lavender and National Trust properties including ; Hidcote Manor garden, Chastleton House and Snowshill Manor. Other activities include; horse riding, golf, cycling, fishing, swimming, theatre and trips to the races. Whether it is a romantic short break or a family holiday there is plenty of activities to suit everyone.